And, yay!!! 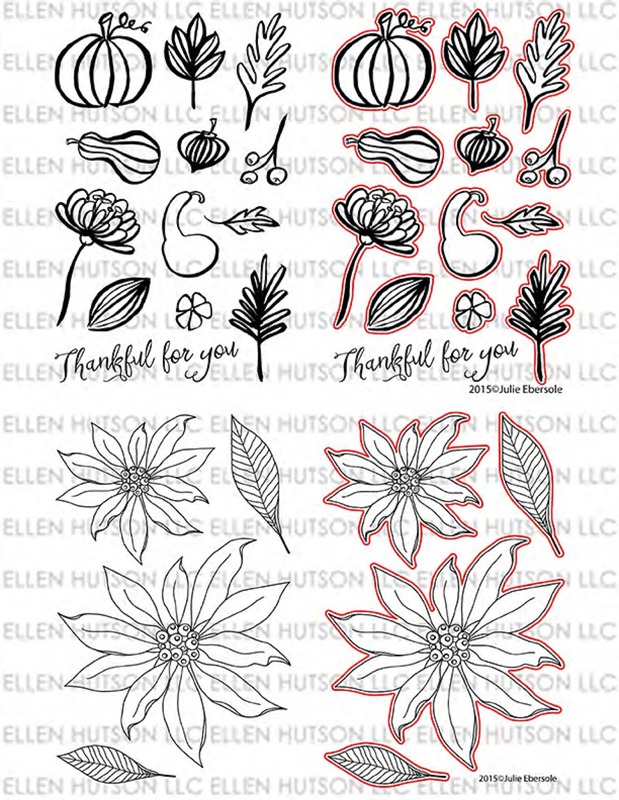 I also get to give this new stamp set, called Thankful to a lucky someone! Please leave a comment to enter my giveaway! Which I also am showcasing today! There is also a Grand Giveaway in the CLASSroom! To enter, be sure to leave a comment there, and at every stop along the hop. Winners will be announced by the weekend! The full hop list at the end of my post. Luscious set called: Mondo Poinsettia! and at every stop along the hop. Winners will be announced by the weekend! 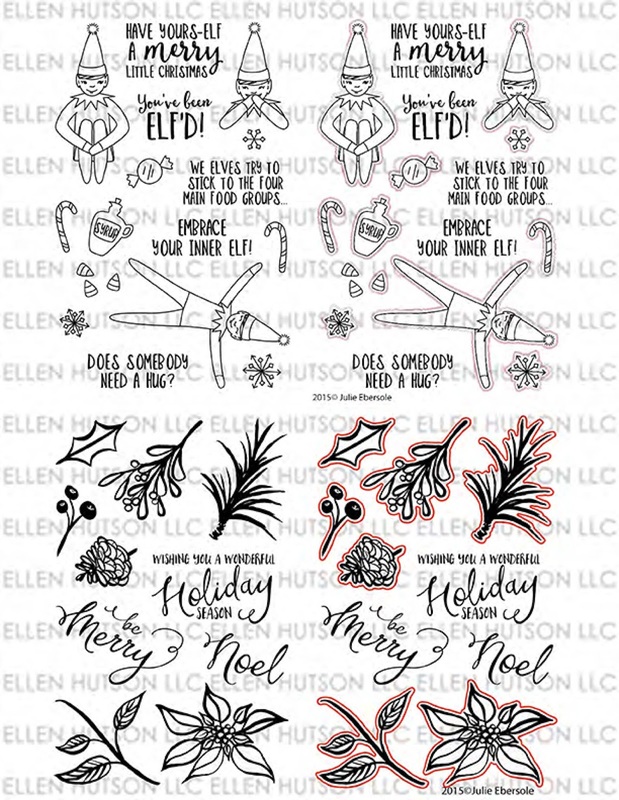 Essentials by Ellen Holiday 2015 Complete Release! Okay.....and a sweet little surprise for last. When we decorate for Christmas... we pile popcorn in a bowl..
would look so cute on a little treat bag! to play with them too! Please ensure you leave your email along with your comments!!!!! Or you have the “no reply” option disabled. (Most likely, I will get ahold of you!! LOVE your BOLD coloring style Kimberly! Swooning over the ESSENTIALS set by Ellen! You are so talented!! Your cards are amazing, beautiful color! Not much for elves but your popcorn treat bag is colored so beautifully I have changed my mind! My cornucopia would runneth over if I won this fabulous stamp set ... thanks Kimberly!!! Loving every little thing you do! I am truly thankful for this chance to win! My Gosh, your colors are so vibrant and your cards so beautiful! I love the red poinsettia card the best! Just gorgeous! Lovely cards and the little treat bag is super cute ! What a fabulous showcase of the new release, Kimberly! The poinsettia...oh my! Mondo marvelous! Great colorful projects for the hop. Getting in the mood for Christmas cards! Awesome cards! Lovely wreath of thanksgiving items. Bold and beautiful! Your cards are inspiring. Thanks. WoW. Stunning projects, Kimberly! LOVE them! Beautiful projects, Kimberly! Loving these new products! Your gift bag is just so cute, thanks for sharing.. 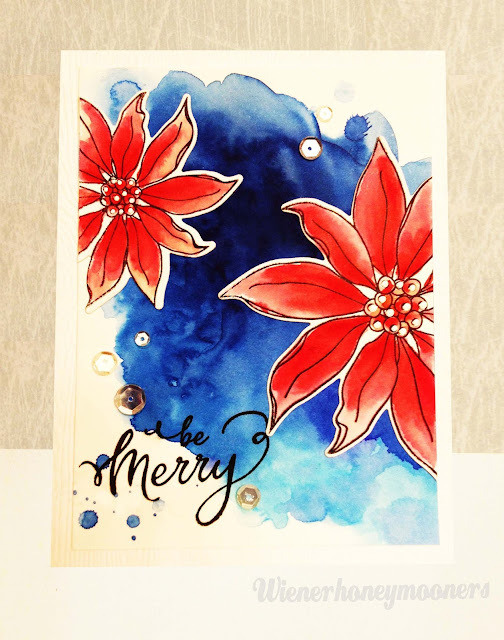 Your blue poinsettia card is gorgeous! Oh Kimberly! Such awesome cards! Love them, every little detail! Gorgeous! Just gorgeous, Kim! And so you, I might add! Both are fab but the poinsettia card takes my breath away! What a beauty! Great cards, I love how vibrant they are. The elf popcorn bag is just adorable. So many fun and inspirational ideas! Love the popcorn with the cute elf. june.swart(at)netzero(dot)net. Such wonderful, whimsical designs! Thanks for the inspiration!! Great idea for a treat bag! Love that elf set so much. WOW, love the watercolor!! And that treat bag, what a FUN idea, and so darn cute!!! Love the simplicity and colors of your cards. Thanks for sharing. Ooooooh, love your cards. This release is awesome. So artsy-love the color combinations! Awesome color on each project. Gorgeous cards and that treat bag is amazing. This is my first visit to your blog but it won't be my last. Now, please excuse me, that popcorn made me hungry so I'm going to go scrounge up something to eat. Love those bright and bold watercolor cards! Love your cards, thanks for the ideas! Popcorn bags are wonderful and your coloring is amazing.... Thanks. Love your watercoloring! Both cards are amazing! And the surprise is so adorable :) Thanks for sharing! Great cards and project. Love the poinsettia but the elf is my favorite! CLEVER CARDS - and love the popcorn bag! What beautiful projects. However, I am partial to that little Elf on a Shelf popcorn bag. Totally brilliant!! Kimberly - I am stunned and amazed and delighted with the way you have watercolored with these amazing stamp sets!! They look so awesome can they are beautiful cards!! Your elf adorned popcorn bad is so super cute and I am just impressed with the talent that oozes out of you!! 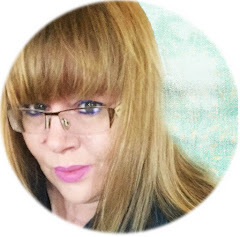 Love seeing your name out in blogland because I admire your talents!! Have a wonderful and delightful day!! I love the watercolor backgrounds - really sets the stamps off. The elf popcorn bag is totally adorable. 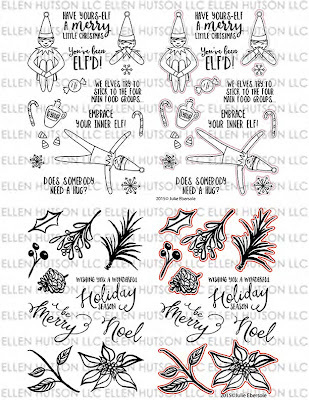 I'm going to have my first grandchild soon, and I just know that elf set is going to work it's way into my stamp stash! Love the bold bright colors of your cards. Great holiday release from EH; can't believe the holidays are just around the corner again. Thank you for the inspiration. 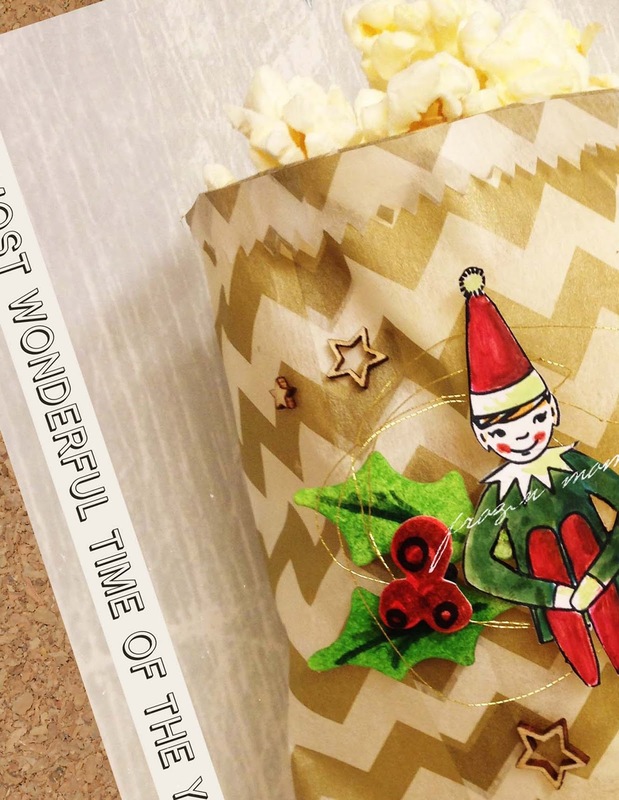 Loved your vibrant cards, and your elf on the popcorn bag is just too cute! Thanks for sharing. I really liked your cards they were colorful and funny. Love your backgrounds on your cards. And the popcorn bag is sweet! The intensity of both cards is vibrant and stunning! Fabulous works of art - TFS. I was already impressed with the cards and then you threw in the elf treat bag and took it over the top! What a great way to show how fun this whole release is and all the great things you can create with them! Thanks for the inspiration and fun. The color on the first two cards is amazing. Three beautiful projects! Love the Thankful images and your color-full wreath! Such cute cards but the treat bag is my favorite! WOW!! All of your projects are amazing Kimberly!! 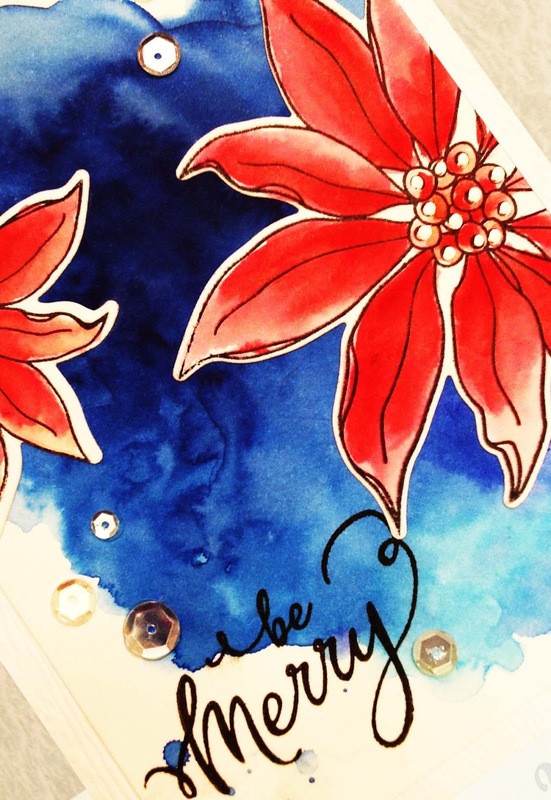 The watercoloring on the poinsettia one is FABULOUS!! Loved your bright colorful projects. Neat way to use the elf stamps. Thanks. Adorable cards. Thank you for the great inspiration! Lots of great cards and that elf on the treat bag is perfect. Beautiful. So much color. Lovely cards! Amazing cards and the popcorn bag...neat idea... love the Elf. Great job showcasing the new sets. Your coloring is so vibrant it makes the stamp designs really pop. Loved the little Elf. Be Merry... just beautiful! Terrific colors and I have to try this. Great stamp set. Thank you! cbee at inbox dot com. LOVED your cards! So bright and cheery! Awesome work! Wonderful cards, really love the elf design! I love your harvest wreath! Fantastic and so gorgeous surrounded by the yellow! The poinsettias really pop with the blue watercolor wash as well! Beautiful cards! I loved the surprise at the end! The elf looks so cute on the bag with the holy leaves and berries! Love your fabulous watercolored cards! Love the elf on the treat bag. Awesome work on the other projects. Your cards are so pretty. Love the elf on the treat bag. Great idea. Love your cards! The Thankful set is my favorite! Love your bold colors on your beautiful cards. 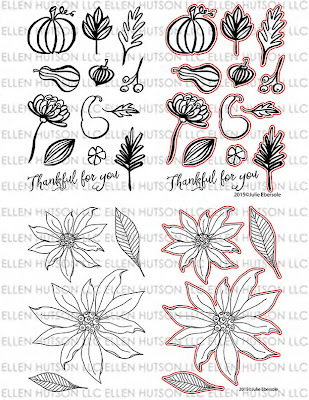 Great inspiration from these new releases from Ellen. 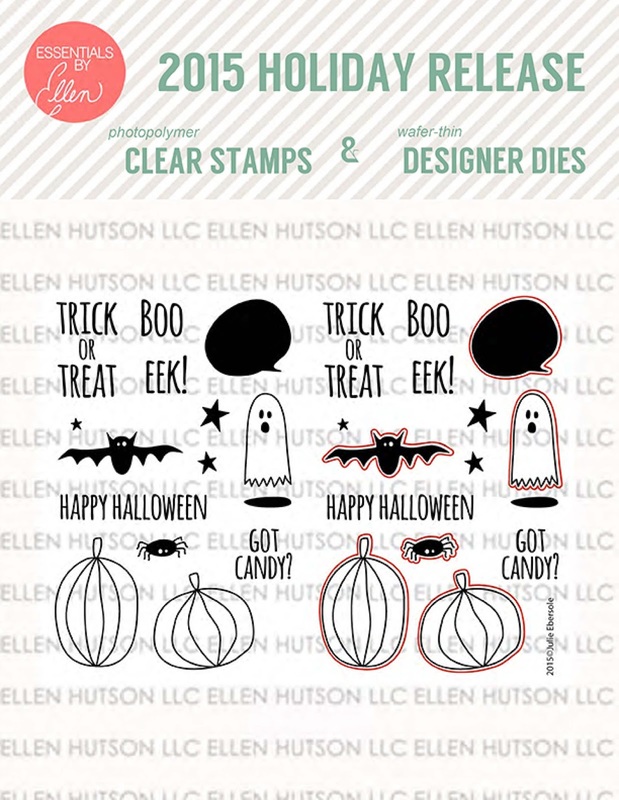 It's so much fun to see everyone's interpretation of these stamps and dies! Great job! Wow, those are some really eye-catching colors! The elf on the popcorn bag was very cute too. Love your cards! That little elf looks like such an imp! Wow! I love the bold colors and patterns! Love the treat bag elf!! What a wonderful idea! It is my favorite stamp of the release!! your mondo poinsettia card is gorgeous!! Beautiful cards and cute bag!!! Wow, your bold colours are fabulous! What gorgeous cards! 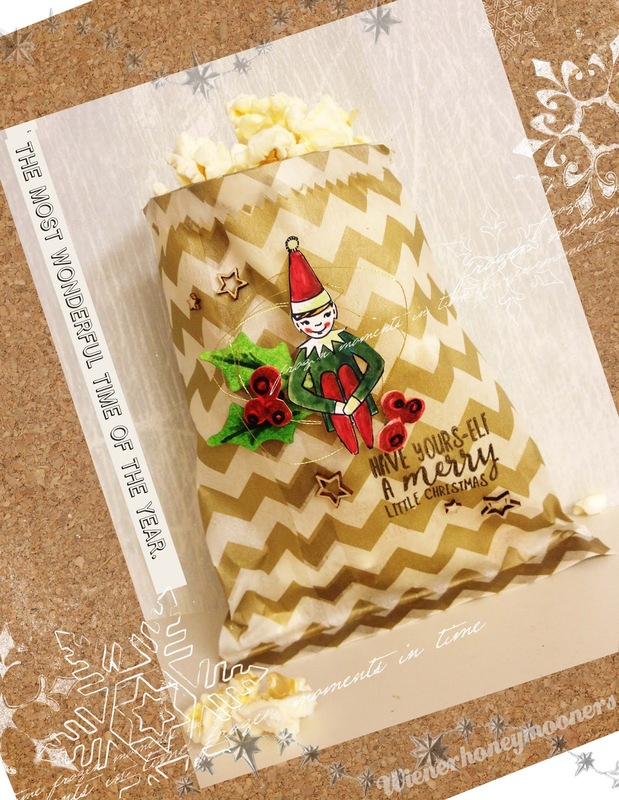 And the elf popcorn bag is totally adorable - I love elves! You samples are so well done. I appreciate the creativity that stirs my imagination. Thanks. Oh my goodness, these are wonderful!!!! What great cards! The popcorn when is very original! I like it! WOW! Love your choice of bright colors, your cards really pop. And the elf treat bag, so adorable. Brilliant projects! Love your treat bag. LOVE LOVE LOVE your cards and elf popcorn bag, the vibrant watercolors are stunning! Love your cards! I am partial to the elf! Love the elf popcorn bag and the colors on the poinsettias...love, love, love!!! omgee So stinkin clever and cute! I love all the bits of gold! Fabulous!!! Wow! Beautiful cards with such vibrant colors. The treat bag is so adorable-great idea. Darling cards with the new sets. I'm so excited to get my hands on a few of them. 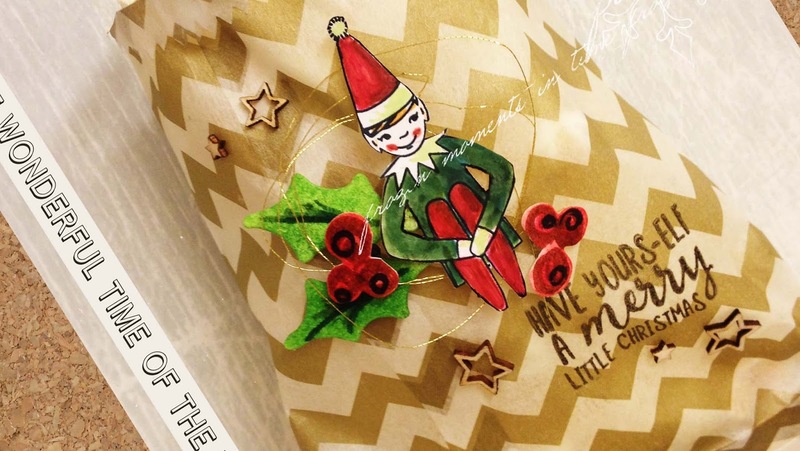 Love your elf goodie idea. Thanks! fabulous set of projects!! love that adorable little treat bag!! Love the new stamps and dies. The elf treat bags are a great idea. Love the treat bag with the little elf. Clean and simple - love them! Wonderful cards! i am so glad that Ellen decided to make dies to go with her stamp sets. That just makes life so much easier. Kimberly, thanks for the Sweet Surprise. How cute it that!!! Your cards and bag are so creative--they really inspired me--thanks! Girl, you ROCKED it...big time! I've always loved your use of color and well, you didn't disappoint! Awesome goodness my friend!!!! Love the treat bag. Great designs by Julie. Love your bold designs, Kimberly. Thanks for a chance to win. Very lovely cards and cute elf! Big WOW on your poinsettia card. Really pretty. Amazing projects--really did a great job of highlighting all the new products. Love the vibrant colors that you used. So pretty. The Mondo Poinsettia is just so over the top spectacular! Thanks for sharing your amazing work! Your cards are so beautiful! I love the watercolors; it will never get old for me. Thanks for sharing your talent with us!! Wooo your colors are bold and beautiful! Love that artsy color wash feel. Such delightful cards!!! Your cards are so colorful and bright! Cute little treat bag! I absolutely love the poinsettias! They always remind me of my mom! 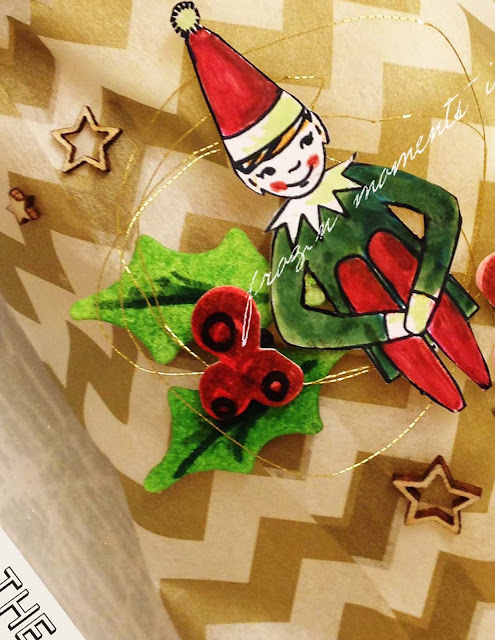 LOVE the coloring you did on this adorable elf! Fabulous water coloring and I love your treat bag, Kimberly! I'm so glad you were part of today's blog hop! I really like your different take on the colors and designs! Love all the bright colors in the cards! I really love these cards, these stamp sets are amazing! I love how bright and cheerful they are! I love that Elf'd set so much! Beautiful cards. I love the poinsettia. Your cards are gorgeous! Such fun and festive ideas! Great cards - gotta love that little elf .... and the poinsettia too. Great blog hop. I really enjoyed your cards, but I especially liked the popcorn bag, how cute! All of these are just so beautiful, and I love your little elf. So cute! Spectacular cards - so much fun! Particularly like the poinsettia card - striking background. Wow! Your cards are wonderful! 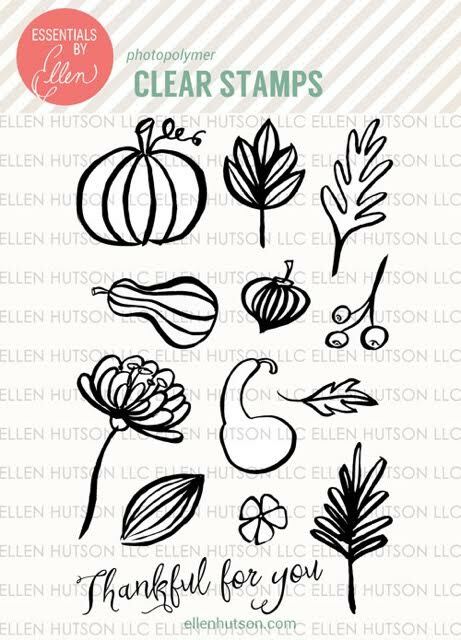 I love how you used the stamps in the Thankful set to form a wreath! Genius! The Mondo Poinsettia is so lovely! How cute is that Elf'd? Thanks for all the inspiration! The elf'd popcorn bag was so cute! I loved the vibrant colors on the cards! Wow Kimberley. What you have done with that Mondo Poinsettia is simply fabulous - I love the bold colours you've used. Spectacular. Thanks for sharing. The blue background on your first card was stunning with the Poinsettias!! Love it! Very nice cards...the one woth the alf is crazy!!! Spectaculars new releases! Hard to pick a favorite. LOVE it..such great cards and gift bag!! BEAUTIFUL cards - WOW - they're SO VIBRANT!!! LOVE your cards! Awesome, as always friend! So fun! i love the new stamps and dies. great job bringing them to life! Love, love the candy bag, as we have spent the last 9 years watch my grandson with "elf on the shelf" it is sure to please this family! Love your cards! I am especially intrigued by the red white & blue christmas card. So unique! Love your cards. That elf is just too cute. your cards and projects are wonderful!!! Beautiful cards! Love that poinsettia! Seriously terrific cards - love the idea of putting that naughty elf on a treat bag. 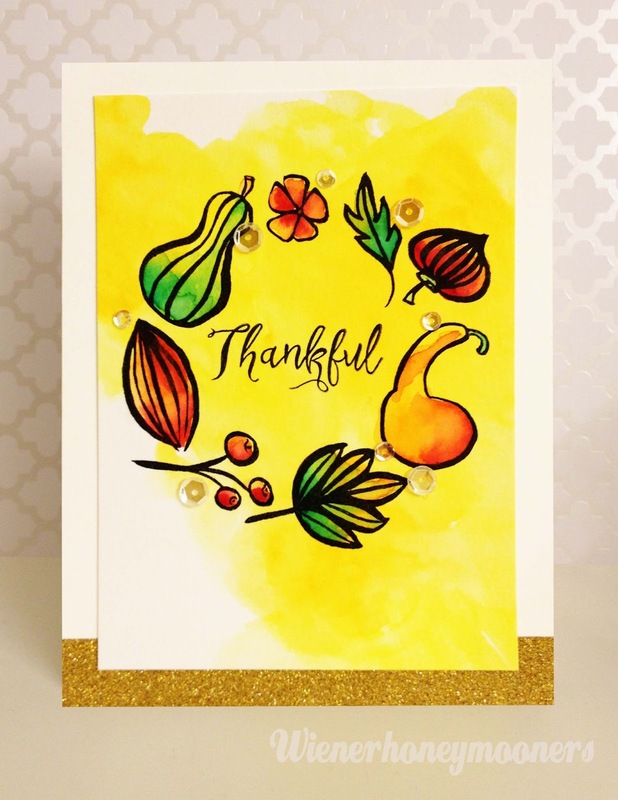 Kimberly, your cards are beautiful, I really like your thankful card with the bright yellow background. Your popcorn treat bag is very cute, and a great idea. I adore that elf too. Your watercoloring is gorgeous! Great cards! Bold and quirky. Love the elf! Great cards! Love the use of such vibrant colours! I love how bright and colorful your cards are! Just beautiful! I love the second card the colors are fabulous! Big beautiful water coloured cards, just love them. Love how colorful your cards are. Thought your wreath was so creative. Thank you. Love your work, especially the watercoloring! Love your striking use of watercolor, so bold and beautiful. Thanks for sharing. Your poinsettia card is incredible!!! Details please on the colouring! Did you mask the flowers to do the background? I LOVE it! Love all your release projects. Very colorful and eye-catching. Such beautiful colors in your cards!! Thanks for the inspiration. Thanks for sharing your stunning cards and cute treat bag. I'm new to your blog and can't wait to see more wonderful ideas. Thanks for sharing. Wow, your colors are so beautiful! I love the elf bag! That is such a cute stamp!